As an example, brethren, of suffering and patience, take the prophets who spoke in the name of the Lord. We count those blessed who endured. These early Jewish readers would immediately remember Hosea who suffered humiliation from his unfaithful wife, yet faithfully loved her and brought her back home as a sign of God’s faithfulness to His unfaithful people. They would remember Jeremiah who fearlessly preached God’s Word to Israel even though God told him that not a single person would heed his message. They would recall Micah who was also ridiculed for his message, and Zechariah who was murdered for his testimony. They would remember Amos and Haggai who were persecuted for the sake of God’s Word; Isaiah who was placed in the hollow of a tree and sawn in half by his own people. Who among them would forget the more recent prophet John the Baptist who was beheaded in a Roman prison because of his faithful ministry? James is reminding his readers that if anyone had it tough, it was the prophets. They were mistreated, misunderstood, maligned and, many of them, murdered. Almost all of them lived difficult lives and died tragic deaths. But James goes on to say that we count those blessed who have endured. Why? Because they are receiving the eternal reward for their ministry! James is reminding us that our present suffering is nothing compared to the glory that will be revealed to us one day in Christ Jesus (Romans 8:18). All these died in faith, without receiving the promises, but having seen them and having welcomed them from a distance, and having confessed that they were strangers and exiles on the earth. For those who say such things make it clear that they are seeking a country of their own. And indeed if they had been thinking of that country from which they went out, they would have had opportunity to return. But as it is, they desire a better country, that is, a heavenly one. Therefore God is not ashamed to be called their God; for He has prepared a city for them - (Hebrews 11:13-16). That last line is incredible: God is not ashamed to be called their God. That’s the blessing that awaits us one day as believers in Christ. Far more precious than a new heaven and a new earth, far greater than the glorified bodies we will receive as we step into immortality, vastly superior to the fact that we will be finally perfected and safely home is the fact that God will not be embarrassed by calling us His own . . . He will, in fact, be proud of us. What amazing grace is that?! So don’t back down or walk away from a tough assignment today. Persevere in the life Christ has planned for you. And keep in mind it is no more difficult for us to live for Christ today than it was for the prophets of old. One day, as the Father beams with pride over us—His frail and often-faltering children—every insult we bore and every injury we suffered will no longer matter as they are exchanged for the rewards of His good pleasure. Let’s follow in the footsteps of the prophets . . . today. Prayer Point: The greatest example of suffering in Scripture is given by Christ Himself; consider all He endured for you, then pray for strength to share in His sufferings. Extra Refreshment: Read Romans 8:12-39 and notice the perspective Paul had in the midst of his suffering. Politics is one of the most polarizing and divisive topics in our culture. People have political affiliations and opinions, and they often enjoy sharing those opinions - sometimes loudly. As believers, we need to remember that God also has an opinion. God has told us how He expects us to relate to our governing authorities and the attitude we are to have regarding those in political power. During the two middle weeks of September, you're going to hear Stephen's brand new series called "Above Politics and Parliaments." 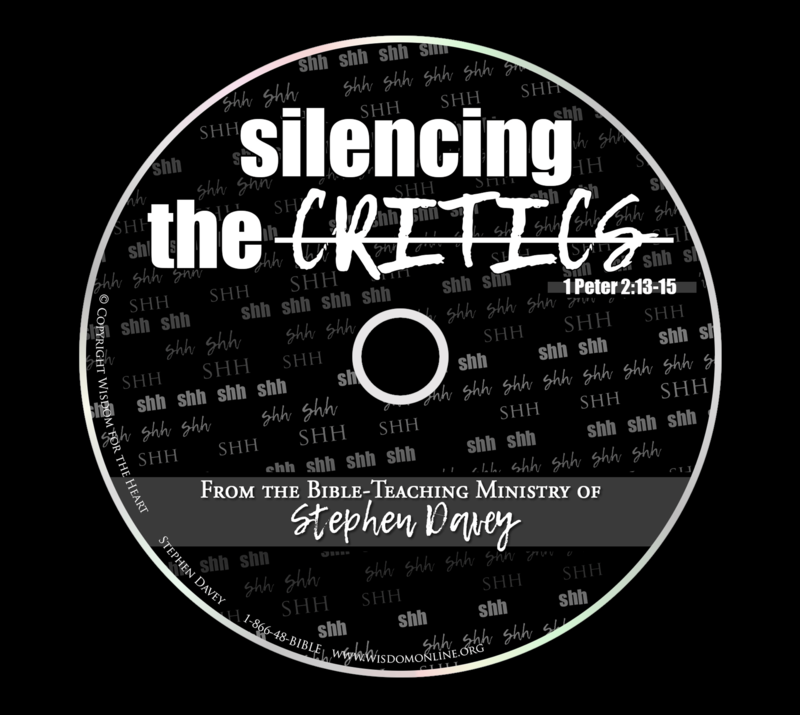 Our featured resource this month is a lesson from that series called "Silencing The Critics." It's our prayer that this series will help you think biblically about politics and your relationship with those whom God has placed over you in civic government.